If you’ve ever had an ear infection, you know how painful and irritating it can be. Your dogs go through the same discomfort when they’re dealing with an ear infection. 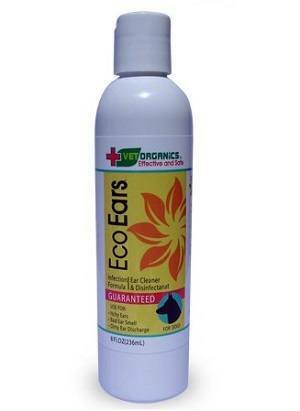 It the problem is fairly minor, or has only recently began happening, you can prevent it from getting worse, and can even completely eliminate the infection in some cases by using the Vet Organics EcoEars dog ear cleaning solution. Provides Immediate Relief From Aches, Pains, & Irritations: If your dog is constantly scratching and digging at their ears, you notice redness and irritation, or you smell that tell-tale smell of infection, the EcoEars solution can work to provide immediate relief. After the first use, your dog will be scratching and digging less, giving the irritation time to heal. Alleviates Itchy Smell & Gunk In As Little As 2 Days: By putting a small amount into your dog’s ears, and letting it sit for up to 90 seconds, you’ll begin noticing signs of improvement in as little as 2 days. Some of the more serious infections can take a few days to begin showing signs of improvement. Includes No Harmful Chemicals: The EcoEars solution is alcohol based to provide soothing relief, without causing additional irritation due to harmful chemical compounds. It’s strong enough to clear up the infection, but still sensitive enough to keep from causing your dog any more discomfort. Destroys Antibiotic Resistant Organisms: A lot of microorganisms and bacteria that cause infections have become resistant to antibiotics. The alcohol based EcoEars formula will help to destroy these bacteria, should they be the cause of the infection. EcoEars can be used in combination with an antibiotic from your vet to help clear up the infection even sooner than with antibiotics alone. 100% Money Back Guarantee: If you use the product and it doesn’t work to relieve your dog of ear aches and pains, simply contact the seller and get 100% of your money back. Most times, you won’t be required to send the bottle back. Have To Keep It In Your Dog’s Ear For 90 Seconds: If your dog doesn’t like to sit still, or has a problem with you messing with their ears for long periods of time, you’re going to have to be patient the first few times you use EcoEars. It needs to stay in their ear for at least 90 seconds to be most effective. May Need A Medicated Solution For Severe Infections: If your dog has a severe infection, or the infection has lasted more than a few days after using the EcoEars solution, you will need to contact a veterinarian. Neglecting to do so could cause permanent damage to your dog’s ear. If your dog is discomfortable, constantly digging and scratching at their ears, or you notice a less-than-savory smell coming out of them, you may be dealing with an infection. The Vet Organics EcoEars solution can help alleviate the pain and discomfort, while working to eliminate the infection at it’s source. To see how EcoEars has helped other customers, click on the button below.